This post was authored by Scott Guthrie, Executive Vice President, Cloud and Enterprise Group, Microsoft. More than ever, organizations are relying on developers to create breakthrough experiences. From start-ups to enterprises to government agencies, developers are creating new digital experiences that are redefining organizations to empower us all. The cloud is a key enabler for this era, bringing powerful, new technology to developers across the globe. But, the cloud also brings with it an unprecedented pace of technology releases and heightened expectations for developers to deliver breakthrough experiences all the time. It is this understanding that shapes how we build and deliver Microsoft Azure. This morning, at Microsoft Build conference in Seattle, I talked about a core design principle for Azure – helping guide your success. Providing powerful tech and lots of new features is necessary, but not sufficient – it is how you achieve success with the cloud that matters most. The cloud is no longer about just who has more features; it’s about how successful you can be with the cloud. To deliver on this principle, we focus Azure innovation on your needs – making cutting edge technology approachable to all developers, and doing the heavy lifting to ensure Azure uniquely meets enterprise scenarios. Trust is one of our core values, and we will continue to lead the industry in our work on security, compliance, privacy, and responsibility. And, Azure is designed for your results, ensuring you have proven guidance, expert advice, and support. With these core tenets, every developer can be successful with Azure – it is this goal the Azure team focuses on delivering every day. For you to be successful, the cloud and the development tools also must work seamlessly together, which is why we ensure great experiences across Azure and the Visual Studio family. Whether it is Visual Studio Enterprise, Visual Studio Team Services, Visual Studio Code – we are committed to providing the most productive developer experience end-to-end. 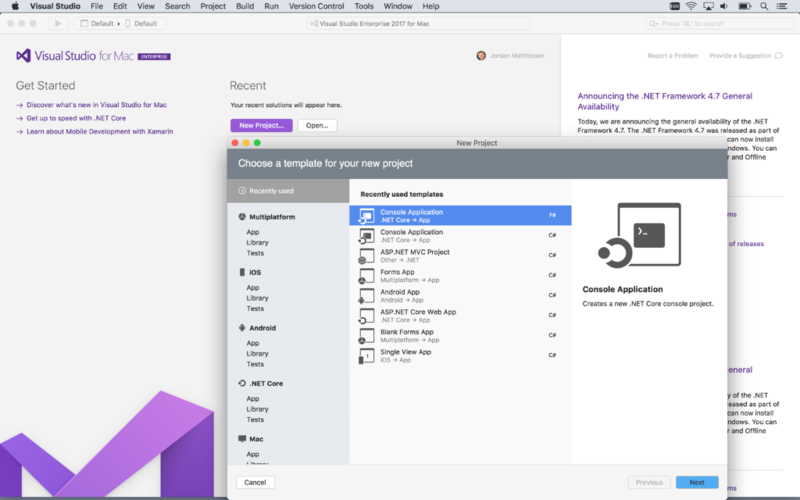 To this end, today we announced the general availability of Visual Studio for Mac. Visual Studio for Mac brings the integrated development environment (IDE) loved by millions to the Mac. Developers get a great IDE and a single environment to not only work on end-to-end solutions - from mobile and web apps to games - but also to integrate with and deploy to Azure. Whether you use C#, F#, .NET Core, ASP.NET Core, Xamarin or Unity, you'll get a best-in-class development environment, natively designed for the Mac. In complement to the IDE and the Azure Portal, we streamlined the experience of working with Azure from the command line. The new Azure Cloud Shell provides an authenticated, browser-based shell experience hosted in Azure, and is accessible from anywhere. Azure takes care of managing and updating Cloud Shell with commonly used command line tools and support for multiple popular programming languages, so that you can stay productive. Each Cloud Shell session provides a ready-to-use environment automatically synced to a $Home directory that is stored in Azure to enable persisting files such as your favorite automation scripts. Azure Cloud Shell maximizes versatility and productivity. Data is a core part of every app and experience developers deliver today. I know that every developer has their database preferences – some love SQL Server, some love MySQL and PostgreSQL. Increasingly, developers want to move to database-as-a-service options, to maximize productivity. Azure is making it possible to develop using any database you prefer and use it as a service. Today, we announced a new service that seamlessly migrates third-party and SQL Server databases into Azure SQL Database with near-zero application downtime. Additionally, we announced the availability of both Azure Database for MySQL and Azure Database for PostgreSQL options in Azure, to ensure developers can use their favorite database with Azure. These new Azure database offerings run as a service and therefore provide high-availability, data protection and recovery, and scale without downtime – all built-in at no extra cost or configuration. But, data isn’t just a core part of apps – increasingly it’s becoming the most mission critical aspect and fundamental to developing intelligent apps. As cloud-based applications increasingly scale, reach global users, and power AI experiences, we have come to a place where we need data at planet scale. Today, we announced Azure Cosmos DB, the first globally distributed, multi-model database service delivering turnkey global distribution with guaranteed uptime and millisecond latency at the 99th percentile. While most database services force you to choose between strong or eventual consistency, Azure Cosmos DB is the only globally distributed database service which offers five well-defined, intuitive consistency choices – so you can select just the right one for your app. These breakthrough capabilities are made possible with the foundational work of Leslie Lamport, Turing Award winner and Microsoft Researcher. Azure Cosmos DB allows you to elastically scale across any number of geographical regions while delivering the industry’s only financially-backed database SLA across availability, latency, throughput, and consistency. As the first and only schema-agnostic database, Azure Cosmos DB automatically indexes data so you can perform blazing fast queries without having to deal with complexities of schema and index management or schema migration in a globally distributed setup. Customers including Jet.com are using Azure Cosmos DB to scale to 100 trillion transactions per day and growing, spanning multiple regions. Tapping into Azure Cosmos DB gives them planet scale, so they can keep focused on growing their business. Beyond data, I continue to talk with developers about the challenges of modernizing existing applications. New container and microservice technologies have incredible benefit, but can require rewriting apps – a luxury most developers don’t have. We’ve been working hard to address this need with Azure. Today, we enable you to use your choice of container orchestration technology including Kubernetes, Docker Swarm, and Mesos DC/OS with Azure Container Service, which allows you flexibility to use containers exactly how you need. Additionally, we’ve also been working hard to help you containerize existing .NET apps and deploy them to Azure. Today we’re extending this scenario to Azure Service Fabric. Service Fabric is a powerful microservices platform that supports the ability to run both Windows- and Linux-based containers. Today, we are updating Service Fabric to natively support Docker Compose for deploying multi-container applications to Service Fabric. This makes it easy to build microservice-based solutions that can leverage the best of the Windows ecosystem and the best of the Linux-based ecosystem – all while easily using the existing code you have. We’re announcing the general availability of container support for Windows Server containers in Azure Service Fabric with the 5.6 runtime and 2.6 SDK release. We’re also previewing Service Fabric support for Docker Compose for deploying containerized apps. And, with the Visual Studio Team Services integration, you can realize continuous integration and deployment of these containerized application integrations. Beyond these advancements, we are also continuing to help you innovate with serverless computing – event-driven programming in a fully managed environment – using Azure Functions and Azure Logic Apps. Microsoft’s serverless offering uniquely includes rich tooling support with Visual Studio, seamless workflow and systems integrations, and built-in DevOps with Visual Studio Team Services, GitHub, and Bitbucket. Today, I’m excited to announce the next step that provides the most productive serverless development experience on the planet. Azure Functions Visual Studio tooling preview, available as a Visual Studio 2017 extension, creates an integrated developer experience. These tools allow you to integrate Azure Functions development seamlessly into development flows: leveraging third-party extensions, testing frameworks, and continuous integration systems. Azure Application Insights support for Azure Functions preview provides better intelligence about Azure Functions code, allowing teams to measure performance, detect issues, and diagnose the source of the problem with serverless apps. Also, we know you want the flexibility to deploy your code everywhere. Azure Functions Runtime preview extends the innovations in Azure Functions to on-premises or anywhere outside of the Azure cloud. Developers can leverage the serverless programming model and bindings on-premises while future-proofing their code assets. Together, these capabilities provide an unmatched developer experience, helping every developer successfully and efficiently build serverless solutions. Developer success is, of course, founded on technology, but just as important is business growth around these developer solutions. This is particularly true of companies providing SaaS solutions. Azure provides a fantastic cloud platform for SaaS-based offerings, but beyond this, Microsoft can also help these SaaS providers grow their business. We recently announced that Office 365 has reached 100 million monthly active users. Azure provides the easiest way for SaaS solutions to integrate with Office 365 and reach those 100 million active users and grow their business. By integrating with Azure Active Directory, Microsoft Power BI, and Microsoft PowerApps, SaaS providers can create a seamless, integrated experience for their customers, making them even more valuable. One of the key capabilities Microsoft has is the largest global sales force. For SaaS providers built on Azure, we will now enable them to publish PowerApps and Flow connectors that Office 365 enterprise customers can use at no extra charge, to integrate the solutions into their productivity workflow. Also for those providers using Microsoft AppSource and who are qualified for our co-sell program, the Microsoft sales force will be compensated to help sell these SaaS solutions into the accounts they cover. The combination of these investments for SaaS companies provide incredible opportunity to grow their business, and give yet another example of how we’re working hard to guide every developer to success. .NET Core 2.0 Preview allows developers to use .NET Standard 2.0’s expanded set of uniform APIs – including XML, Serialization, Networking, IO, and thousands more –  to write once and run on multiple .NET runtimes (.NET Framework, .NET Core, Xamarin and Universal Windows Platform). ASP.NET Core 2.0 Preview’s new capabilities include Razor Pages, a lightweight syntax for combining server code with HTML, streamlined startup, even more performance improvements – and ASP.NET Core 2.0 web apps can now leverage automatic Azure diagnostics and monitoring, without requiring developers to write any code or republish the application. Visual Studio 2017 version 15.2 delivers bug fixes and new functionality that was not previously available in the past releases, including the return of Python workload and Data Science workload (includes R, Python, and F#) and added support for Typescript 2.2. Visual Studio 2017 version 15.3 Preview includes bug fixes, improvements in accessibility, and new functionality; most notably .NET Core 2.0 preview support, Live Unit Testing for .NET Core projects, more C++ standard conformance, enhancement in continuous delivery for ASP.NET and ASP.NET Core projects targeting an Azure App Services, and improvements in container development tools. Visual Studio Snapshot Debugger, our new cloud debugging experience, gives developers deep insight into cloud production code behavior at the time of an exception, without writing extensive logging statements or exception handling code. Azure Batch Rendering offers an easy way to help scale rendering jobs using market leading applications like Autodesk 3ds Max and Maya. Teaming up with Autodesk, Azure is the first public cloud to offer this seamless integration across, client application, licensing, orchestration and infrastructure. Low-priority Batch for Linux and Windows VMs introduces access to surplus capacity using Azure Batch. At discounts up to 80%, Low-priority Batch increases the flexibility and cost-control for large-scale workloads, allowing you to mix and match low-priority and on-demand VMs. New capabilities for VM maintenance and availability, including Scheduled events and instance metadata API are now in Public Preview. With this new feature, applications running in a VM can learn about upcoming updates. In the rare case that maintenance requires VM reboots or redeploy, we now offer the capability for customers to select a timeframe within a 30-day window to schedule the maintenance. We can now also detect and predict some imminent hardware failures, and perform VM live migration to another server to avoid disruption to you. Storage Service Encryption for Azure Files on all available redundancy types (LRS and GRS) at no additional cost, that ensures that all data being stored in Azure Files is encrypted using AES-256. New Azure Service Catalog to enable organizations to package and curate managed applications approved for an organization’s use. Managed disks support for Azure DevTest Labs including VM OS disks, data disks, and custom images that makes storage and cost management easier. Azure Functions with Common Data Service is available in preview, to create and use Azure Functions with Common Data Service (CDS) to extend the functionality of apps. Azure SQL Database enhancements including Managed Instance private preview, which offers SQL Server instance-level compatibility like VNET, SQL Agent, 3-part names, and CDC, making it even easier for you to migrate SQL Server apps to Azure SQL Database. We also announced preview coming soon for Graph support and General Availability for Threat Detection. General Availability of Azure HDInsight 3.6 backed by our enterprise grade SLA. HDInsight 3.6 brings the latest versions of various open source components in Apache Hadoop & Spark eco-system to the cloud, allowing you to deploy them easily and run them reliably on an enterprise grade platform. New previews of Azure Accelerated Network to reduce network latency and VM overhead by off-loading the VM network interface to an FPGA. CDN Enhanced Integrations with App Services and Storage so you can add CDN to your Azure web app service or Azure storage account without leaving the respective portal experience.